FCFA is training African scientists in new skills and methodologies to study the African climate. 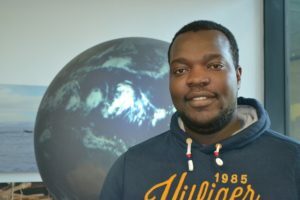 Famien Moise participated as a trainer in a week-long workshop on climate modelling at the University of Leeds, organised by the Africa Monsoon Multidisciplinary Analysis 2050 (AMMA-2050) project in December 2016. Famien Moise began his higher education with a broad study of the physical environment. Then, motivated by what he describes as the “harsh impacts” of climate change on his home country of Cote d’Ivoire and the broader west African region, he decided to focus his career on climate science. Mr Famien recently completed a PhD that investigated the decadal variability of the west African monsoon. He also honed his skills to assess and provide expert analyses of extreme weather events. His next assignment will be to research the region’s climate trends as part of FCFA’s Africa Monsoon Multidisciplinary Analysis 2050 (AMMA-2050) project. As a trainer in the workshop in Leeds, Mr Famien is not only transferring his skills to other west Africans in Python, a script for programming climate models. He is also acquiring new knowledge from his peers that will aid his future research. There will be ample opportunities, he added, to pass the new knowledge to students in his home institution who are just starting out on climate change research.